The White-tailed buzzard or White-tailed hawk (Buteo albicaudatus Viellot, 1816) is a bird of the New World belonging to the order of the Accipitriformes and to the family of the Accipitridae. In 2014 Collar and del Hoyo have re-classified this bird placing it in the genus Geranoaetus, choice by sure more appropriate and more suitable to this bird in light of the morphological resemblance as well as behavioural of the congener and so-called Chilean blue eagle (Geranoaetus melanoleucus) that, however, seems to replace it in that part of South American range not frequented by the albicaudatus, of more reduced size but extremely similar except in the tail colour. It is one of the birds of prey frequently chosen for the falconry and this is why it is found present in the aviaries of professionals of the sector or lovers of this old art. As a matter of fact, it is a docile bird, easy to train and also resistant to the detention conditions to which is subjected. The ethymology of the scientific name refers to “buteo” = buzzard and “albicaudatus” = with the white tail, rightly due to the evident white colour of its extremity. For what the new genus Geranoaetus is concerned, the term comes from the Greek “geranos” = crane and “aetos” = eagle. For what the vulgar names given to this bird are concerned, they are simply a consequence of its morphology. 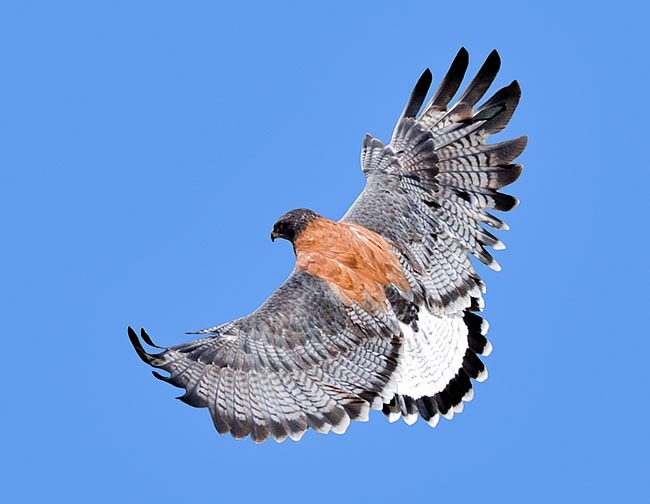 In English, White-tailed hawk / buzzard ; in German, Weisschanzbussard ; in French, Buse à queue blanche ; in South American Spanish, Aguila, Aguililla, Aguilucho, Gavilan cola blanca ; in Dutch, Witstaart Buizerd. It must be noted that in the various vernaculars the same bird is at times called hawk, others buzzard, then goshawk and in others more, eagle, just to mean the extreme variety of interpretation the ornithologists give of this bird of prey. It has a very vast range spacing from the south-western regions of USA up to South America, including most of Argentina, but systematically omitting the part interested by the Andes cordillera. Besides being widespread in Central America, it is found also in many Caribbean islands. This buzzard is amply present in its area even if not in great number but such not to be considered as an endangered species. Some subspecies have been identified related in particular with the different livery that may vary from the marked white up to forms of pseudo genetic melanism as well as in slight differences in the size. Although the young carry on wide ranging movements, it is considered as a sedentary bird with minor territorial displacements that see the temporary abandon of some areas mainly due to lack of food. The population is in slight increase in the northern part of the range. It lives in plains and in sparse forests, in even flooded prairies and often in cultivated areas and frequents, when available, also shrubby areas with low bushes. The favourite environment is located under the 600 metres of altitude. It loves hunting with the technique of the overflight or of momentary and sudden stops like that of the “Holy Ghost” for observing the underlying ground looking for potential preys but ready to rapidly glide of some tens of metres and stubbornly resume the same operations. The fact of frequenting also flooded and swampy meadows leads this raptor to often hunt frogs and toads though its preys vary from small rodents, to the opossums, from the lizards to the snakes. Even if not within their habits, it often predates also nests found on the ground. In North America the choice victim is the wild rabbit whilst in the South-American forests it is not rare to observe it while predating small monkeys and squirrels. When the food is lacking it does not disdain to eat carrions too. The sizes of this buzzard are not indifferent. 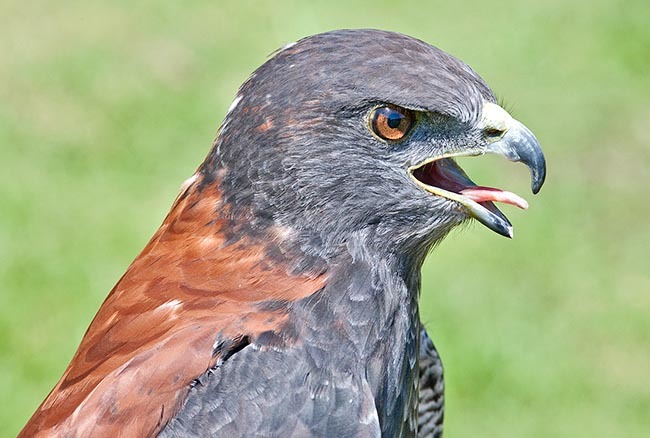 Despite being smaller than its congener Chilean eagle, it easily reaches the 60 cm of length and a wingspan of about 150 cm. The weight varies in the sexes from 900 to 1200 g with prevalence of the female that is markedly bigger. Also the tail length exceeds the 20 cm. The adults have a greyish/violaceous colouration in the upper part of the wings and white in the lower one. The shoulders show a vast brown area visible when flying and also when perching. The chest is white in the upper part and is completely grey striped in the lower part with black head and throat and the underwing is stylishly striped with thin and thick grey lines. The head and the throat are usually black an the beak has yellow-greenish cere with black tip. Quite showy, especially when flying, over as well as under, is the black edged white tail. The eyes are of a pale hazel colour little visible from far away. The legs are yellow, quite showy when flying. The juveniles differ for the less bright colouration but with a greater contrast between the white and the black of the livery than in the adults. They often are darker, without the brown spot on the shoulders and the wholly blackish tail. 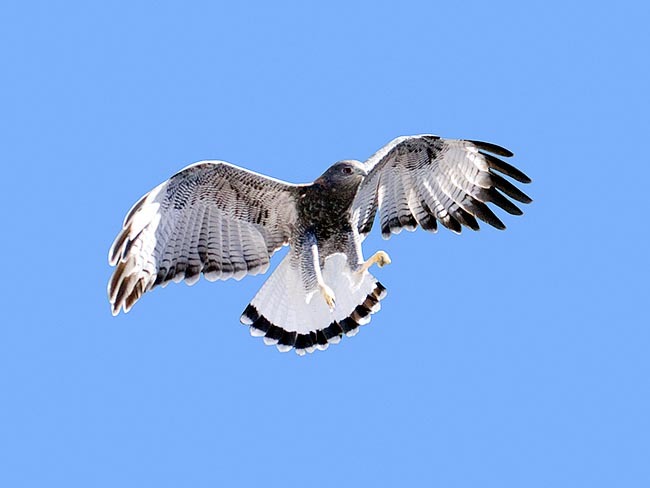 The white-tailed buzzard when overflies the nesting territory emits a series of chirping sounds often more similar to those emitted by terrestrial animals than by birds. It is very careful and strongly protects its territory that often does not abandon for years continuing to nidify in the same position so much to transform the nest in a huge pile of branches and leaves. The nest is done on thorny plants at variable heights but never beyond the 5 m. For placing its nest, it often uses the yucca trees, in any case always choosing positions from where it can observe and keep under control the whole occupied territory. It lays 1 to 3 eggs, completely white, at times slightly spotted of brown, it hatches for about 40 days. The young take off after about 8 weeks from the birth. Geranoaetus albicaudatus del Hoyo e Collar, 2014.